Or: Cheap zoom vs cheap prime. When I talk to my students, either in class or in the field, they often ask me about lenses. They already have one, and it’s almost always the “kit lens” that came with the camera, usually an 18-55mm with a variable maximum aperture, like f/3.5 at 18mm and f/5.6 at 55mm. It’s hard to criticize these lenses because they are generally cheap, lightweight, versatile, and sharp. 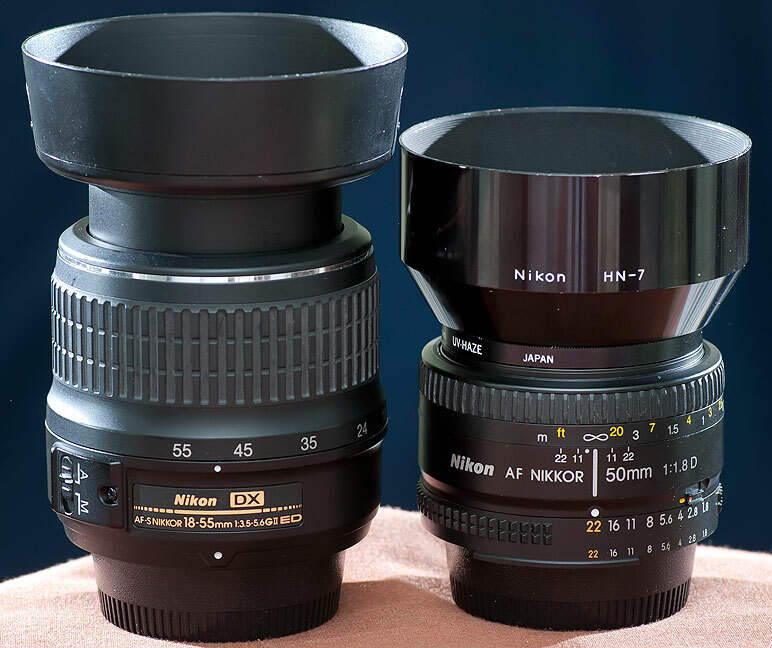 Sometimes the kits include an additional telephoto lens; Nikon offers a small, lightweight 55-200mm f/4-5.6. The players in today’s comparison are the AF-S Nikkor 18-55mm f/3.5-5.6, and the AF Nikkor f/1.8. Often my recommendation is a “prime” lens, meaning one that isn’t a zoom, and because most people don’t have much budget, I like to recommend the “nifty fifty,” as it has become known, the 50mm f/1.8. Nikon and Canon both make and sell them, and, like the kit zooms, they are cheap, lightweight, versatile and sharp. But of course, they have a trump card: f/1.8. Alas, my advice about the 50mm often falls on deaf ears, since it is hard to express, no matter how passionately I make my case, the value of a lens they think they already own in the zoom range of their kit lens. This morning I decided to illustrate, in a concrete and specific way, why I think the 50mm f/1.8 (or, if you have a big budget, the f/1.4 or f/1.2) is an outstanding addition to any photographer’s bag. 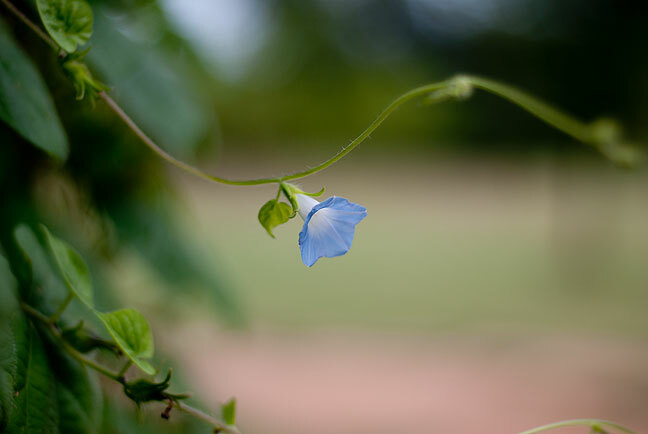 I did so by shooting the morning glory in our front yard, first with the kit lens, then with the 50mm f/1.8, both at their largest possible aperture for that focal length. The comparison doesn’t have a big “wow” factor, as much as it has an “ah.” Ultimately it comes down to your imaging goals, but an f/1.8 might be just the thing to take your imaging to the next level. Made with the 18-55mm at 50mm at its largest aperture for that focal length, f/5.6, this image is sharp, but a little uninspiring. 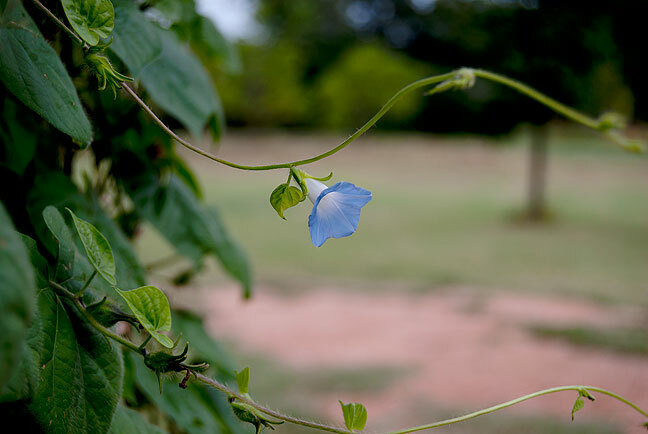 This is the same scene made with the 50mm f/1.8, at f/1.8. Note how much more gracefully and elegantly the background elements of the image melt away, giving a better sense for the delicacy of the scene. I’m enjoying the hell out of my nifty fifty. A good primer on prime. Of course, in addition to the smooth and less distracting background, are the ability to shoot in lower light with faster exposures (or lower ISO or both), and brighter images in your optical viewfinder… Since f/1.8 lets in about eight times as much light as f/5.6 (or almost three stops, if they care to learn that term).